Two thousand years ago, two low-mass stars collided in an extremely rare stellar wreck, generating a brilliant burst of light that reached Earth in 1670. Initially visible to the unaided eye, the “new star,” now known as CK Vulpeculae (CK Vul), quickly faded from view. A single dim star surrounded by glowing clouds of gas visible only in large telescopes is all that remains today. 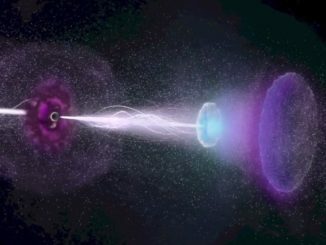 But astronomers using the Atacama Large Millimetre Array (ALMA) and the Northern Extended Millimetre Array (NOEMA) radio telescopes to study the aftermath of the explosive merger have found the first convincing evidence of radioactive debris outside Earth’s solar system. The molecule in question is made up of a radioactive isotope of aluminium with 13 protons and 13 neutrons bound together with atoms of fluorine – 26AlF. 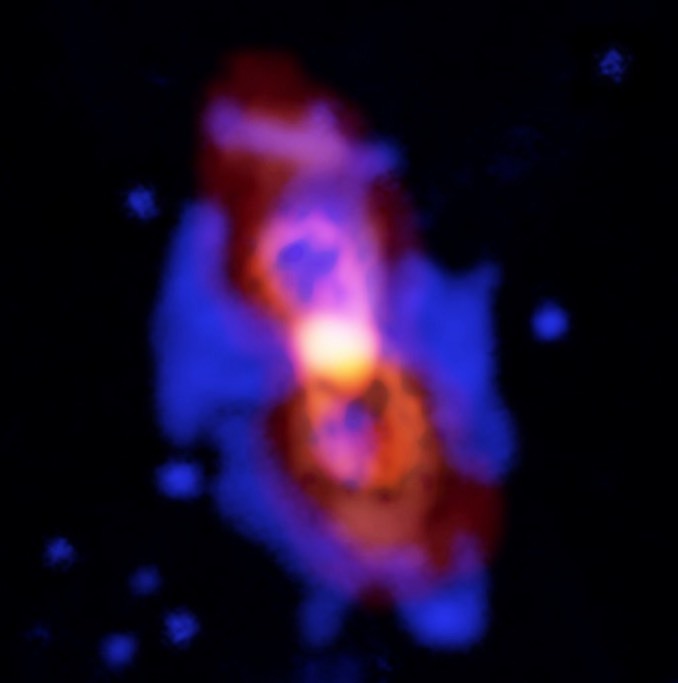 “The first solid detection of this kind of radioactive molecule is an important milestone in our exploration of the cool molecular universe,” said Tomasz Kamiński, an astronomer with the Harvard-Smithsonian Center for Astrophysics and lead author on a paper appearing in Nature Astronomy. 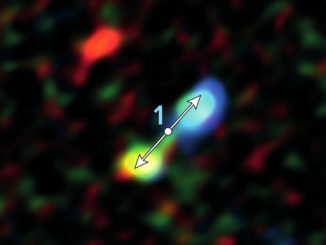 The spectral signature of the molecule was found in the debris around CK Vul, emitting a characteristic millimetre-wavelength radiation through a process known as rotational transition. 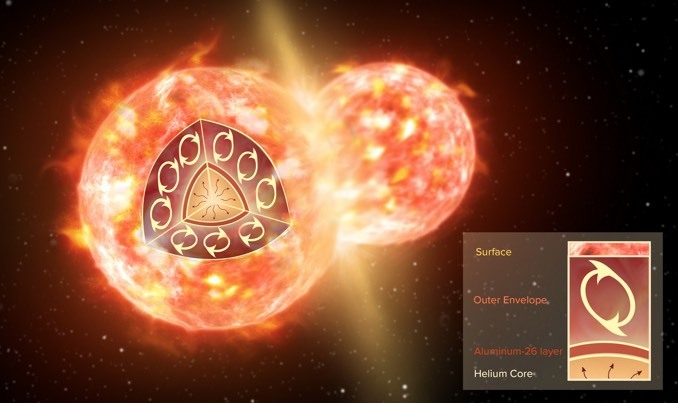 The observations provide fresh insight into the mechanics of rare mergers like the one that created CK Vul, showing that heavy elements and isotopes formed in the deep interior of a star can be thrown out into space in such cataclysmic collisions. Based on earlier gamma ray observations, astronomers have known for decades that about three solar masses worth of 26Al is spread across the Milky Way, but until now they could not pinpoint individual sources or determine how the radioactive material got there. It appears CK Vul contains enough 26Al to make up about a quarter of the mass of Pluto. Given how rare stellar mergers appear to be, it is unlikely such collisions are the sole source of the material. But ALMA and NOEMA can only detect 26Al that is bound with fluorine. The actual amount in CK Vul and elsewhere may be greater and merger rates underestimated. At the centre of our galaxy, in the immediate vicinity of its supermassive black hole, is a region wracked by powerful tidal forces and bathed in intense ultraviolet light and X-ray radiation. These harsh conditions, astronomers surmise, do not favour star formation, especially low-mass stars like our Sun. Surprisingly, new observations suggest otherwise. 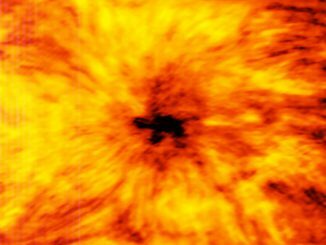 New images taken with the Atacama Large Millimeter/submillimeter Array in Chile have revealed otherwise invisible details of our Sun, including a new view of the dark, contorted centre of a sunspot that is nearly twice the diameter of the Earth.